We stayed for four days at the 7 Sages Xian youth hostel, one of the prettiest and most welcoming hostels we stayed at during our year of travel. I picked up a flyer for 7 Sages Hostel in Xian at the Rock and Wood Hostel in Shanghai – also a YHA China hostel. The 7 Sages caught my eye because the property flyer advertised it as one of the world’s most unusual hostels. With private room rates of US$12 per person per night, it seemed like we just had to stay here. The 7 Sages hostel is in central Xian a short walk from the train station and inside the old city walls. This Xian youth hostel is in a class Chinese row house. The building were remodeled at the beginning of the 20th century. They were once used as the Eight Route army Xian Office where the red army stayed in Xian. The hostel is situated around two courtyard areas with charming circular-arched doorways and a courtyard planted with trees and shrubs. There were row house on this very site, dating back to the Tang dynasty in 618AD. The young staff of the YHA China hostel was cooperative, friendly and helpful. Language was never an issue and when there was a problem (we accidentally check out a day early), they were eager and ready to help. There’s not a lot of room in the basic eight-person dorms in this Xian youth hostel. The shared bathrooms were clean – mostly. But, at $24 per night for private rooms, we felt like we were in backpacker luxury. These spacious rooms are simply decorated with modern furnishings with western-style ensuite bathrooms. We arrived in Xian in mid-afternoon after a very early flight from Nanjing – we were hungry. We took a seat at one of the tables in central courtyard and ordered snacks from the onsite restaurant. And that, basically, was all she wrote. We spent a lot of our time in Xian lounging in the sun in that courtyard and eating at that little restaurant. It was a relaxing break from the hustle and bustle of backpacker travel. The food was tasty with plenty of local and western-style choices. We were able to book tours to see the Terracotta Warriors through the hostel and this was only one of a varied menu of activities on offer. Many Xian youth hostels offer sightseeing tours. We were very satisfied with the ones we booked through 7 Sages. 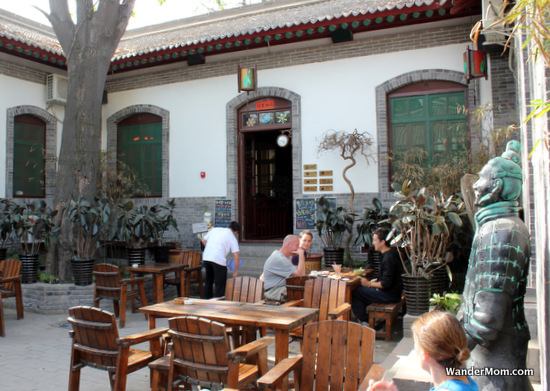 This Xian youth hostel is also a great base for exploring central Xian. 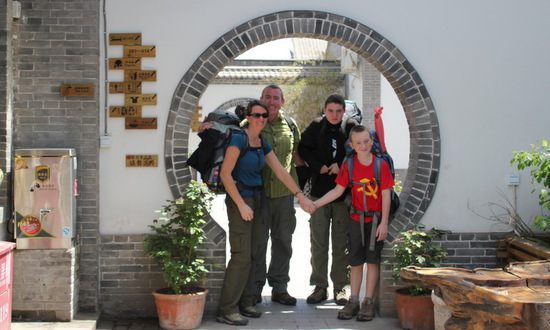 This entry was posted in China, International Escapades and tagged 7 Sages Hostel, Accommodation, China, Xian, YHA China on July 24, 2012 by wandermom.